1. 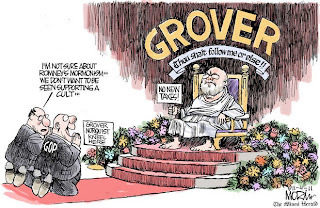 I am Grover thy God, who has brought thee out of the land of liberalism, out of the house of FDR. Thou shalt have no taxes before me. 2. Thou shalt not make unto thee any graven image or any likeness of the 99%, that is in heaven above or the earth beneath. Thou shalt not bow down to them or try to help them, for I Grover thy God am a jealous God, visiting the income inequality of the fathers upon the children, unto the third and fourth generation. 3. 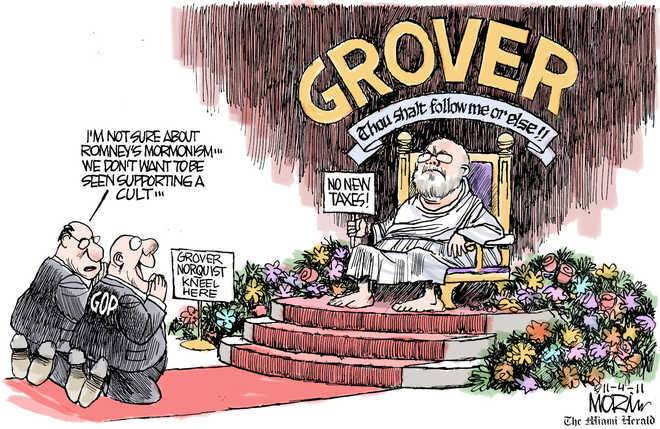 Thou shalt not take the name of Grover thy God in vain, for thy God will not hold him free of a primary challenge who taketh His name in vain. 4. Remember the seventh day and keep it holy. Six days shalt thou take from the middle class, and do all thy dirty work; but on the seventh day it is the day of rest and offshore tax havens. 5. Honor thy banker and thy hedge fund manager, that thy days may be rich in the land which capitalism hath given thee. 6. Thou shalt not kill the 1 percent's tax breaks. 7. Thou shalt not commit compromise with Democrats. 8. Thou shalt not take from the Koch brothers without delivering legislation in return. 9. Thou shalt not bear false witness against Fox News. 10. Thou shalt not covet European health care, nor longer lifespans and better outcomes, nor higher wages and paid sick days, nor greater income equality, nor any advantage that is Europe's. And the ghost of Ronald Reagan said unto the Republicans in Congress, Fear not; for Grover thy God is come to prove your ideological purity, that his fear may be before your faces, and ye cooperate with the Black Muslim Kenyan Socialist usurper never. An altar of scorched-earth legislation thou shalt make unto me, and shall sacrifice thereon thy Social Security and thy Medicare, thy unions and thy reproductive rights; in all places where I record how many government programs thou hath killed in my name, I will come unto thee, and I will bless thee.